College: Van Winden was selected First-Team All PAC-12 as an opposite for UCLA as a freshman, helping the team to an Elite Eight appearance. She also played beach volleyball at UCLA, finishing with a 28-5 match record that helped UCLA to its best ever team record in beach volleyball to that point. Van Winden then transferred to Cal Poly, where in her first indoor season she was sixth in the nation with 4.83 kills per set, which was also the second highest single season mark in program history. On the beach she finished with a 19-9 mark while playing at the No. 1 spot. 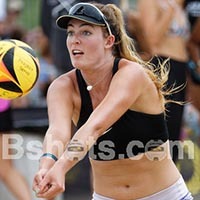 Personal: Van Winden's mother, Kelly (Strand), was an All-American as an outside hitter at Cal Poly and former pro beach volleyball player, while her 6'9" father, James, played basketball at Cal Poly. Van Winden has an older sister, Adlee, who played volleyball at Cal Poly, and a cousin, Micah Ma'a, who played volleyball at UCLA). Van Winden did not play volleyball her senior season of high school as she graduated early and enrolled at UCLA.